Malaysian Prime Minister Dr Mahathir Mohamad praised Sri Lanka’s steady progress and assured continued cooperation. He said this during a meeting with President Maitthripala Sirisena at the Hotel Plaza in New York yesterday (September 26), the President’s Media Division said. The two leaders exchanged pleasantries and Dr Mohamad recalled earlier meetings between them, particularly about a meeting in Kualalumpur in 2017 when he was out of power. He thanked President Sirisena for making that special effort to meet him when he was not the leader of Malaysia. President Sirisena congratulated Dr Mahathir on his significant victory at the last general elections and briefed him about the progress made in the last three and a half years. He asked Malaysia to increase investments in Sri Lanka, and Dr Mahathir readily agreed. Dr Mohamed said that Malaysia would increase assistance to megapolis programmes for construction of high-rise apartments for settling urban slum dwellers. Minister of Megapolis, Champika Ranawaka, who accompanied the President, requested that the Malaysian credit facilities extended to construction sector be increased. The Malaysian Prime Minister said that he continues the foreign policy of the former government. He said that Malaysia, while welcoming foreign investments, is very keen to safeguard interests of the country. President Sirisena said that Sri Lanka too follow a similar policy on foreign investments. Two leaders exchanged views on regional and international developments. Ministers Tilak Marapana, Rajitha Senaratne, Champika Ranawaka and Mano Ganeshan also took part in this meeting. 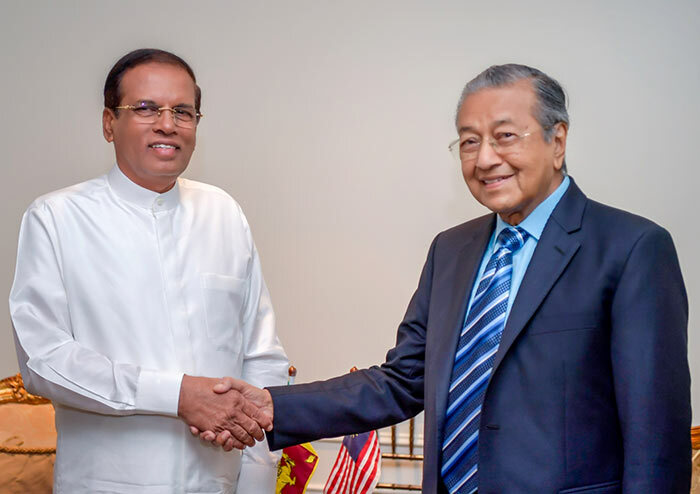 Dr Mahathir Mohamed accepted the invitation extended to him by President Maithripala Sirisena for a visit to Sri Lanka.